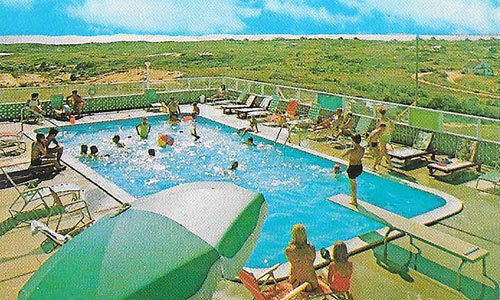 If you like to relax by the water, Cape View Motel is the place to stay. You are surrounded by the natural beauty of the Cape Cod National Seashore, with miles of ocean surf, stunning beaches, scenic hiking trails through native terrain and bike paths over rolling dunes. You can even enjoy a sweeping view of Provincetown Harbor from a new modern lounge chair at our pristine heated outdoor pool. We continue to make impressive updates to enhance your stay at the Cape View Motel. New plush mattresses and soft, beachy linens complement the brightly-colored coverlets and draperies. We brightened the standard rooms with new sandy-colored carpets and natural wood furnishings. Fresh coats of paint in soft hues tie everything together. We've also added fluffy white bath towels, flat-screen TV's and Keurig coffee makers in every room. Newly installed, secure high-speed internet access is provided for free. The main building has a new, elegant deck structure with two staircases for added safety and convenience. Room doors now have keyless entry and the motel is illuminated with bright, energy-efficient LED lights. Several park-style barbeque grills have been installed on the grounds if you want to stay close and cookout. 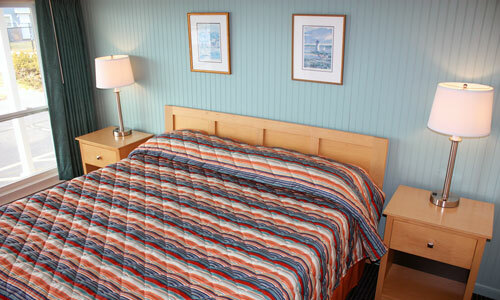 Some details you've come to expect from the Cape View Motel will always remain, like spectacular sunset views of Cape Cod Bay from every room. All of our spacious and comfortable rooms have air conditioning and a private bath. Kitchenette and Deluxe rooms have large sliding glass doors that open to a furnished private balcony. It's the perfect place to enjoy a delicious meal prepared in your well-appointed kitchen. Nearby Provincetown is the entertainment and cultural hub of the Outer Cape, filled with art galleries, museums, live music, theaters, unique shops, boutiques, and restaurants for every taste. Provincetown is also the best place in New England for Whale Watching - an unforgettable experience not to be missed. There is a Shuttle Bus available every 30 minutes into Provincetown so you don't have to worry about parking. 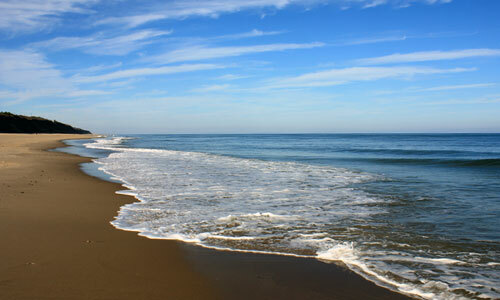 Charming Wellfleet village, home of the world-famous Wellfleet Oysters, is only 10 minutes south of Cape View. Catch a movie at the Wellfleet Drive-In Theatre, play a round of golf at Chequessett Yacht Club, gather local edibles at the Wellfleet Farmer's Market, and savor steamed lobster dripping with butter at Mac's Seafood while you watch the sunset over picturesque Wellfleet Harbor. You'll find great shopping at the many art galleries and quaint boutiques throughout the town too.